State athletic titles are tough to win. In some 50 years of trying, Central Dauphin School District teams hauled in just one – the 1997 State Baseball Crown won by Central Dauphin High. But all that changed at this year's PIAA State Track & Field Championships in Shippensburg Memorial Day weekend. 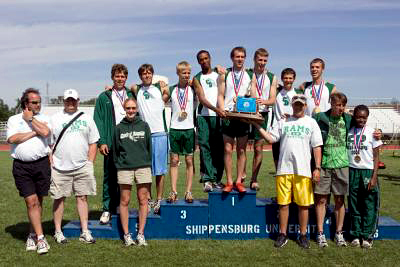 In just two years as head coach of the boys track team at Central Dauphin High School, however, G. Thomas Eck led his team to the 2004 state title, and missed winning the 2003 state title by two points– an amazing accomplishment according to District Athletic Director Joseph Bressi. Eck, his fellow coaches and members of the 2004 State Champion AAA Boys track team were honored for their feats in a ring ceremony held today at Central Dauphin High School's Landis Field. Also, on June 14, 2004 Governor Ed Rendell and the State House and Senate presented the athletes and coaches with congratulatory citations. In a sport defined by gutsy individual performances, Eck promoted an all-for-one, one-for-all team philosophy. "I know it's an individual sport," Eck said, "but it can be a team sport too." Gone are the days, Eck said, when Central Dauphin High track members leave after their event is complete. "When you have a bunch of extra people cheering for you it generates a little extra momentum." "It helps a lot," said Ryan Whiting, a gold medalist and state record holder in discus and silver medalist in the shot put. "A lot of the runners would stay and watch," Whiting said, adding that team members under Eck's system simply know each other better. "It was a big change," said Mark Wieder who ran the anchor leg on the team's gold medal 4x800-meter relay team as well as the fourth-place 4x400-relay team. "He (Eck) brought more team into the sport and as you can see it worked out," said Wieder who will attend Virginia Tech in the fall. To a great extent, good track performances "come from within," said Ryan Jones, who ran the second leg of both the 400 and 800-meter relays. But, he said, when the whole team sticks around and cheers "it just gives you that extra push." Jones, who will attend William and Mary College in the fall, said the team in the pre-Eck era lacked direction. "They brought in coach Eck and he said 'we are actually going to be serious.'" Jones and Wieder were part of the team that narrowly missed winning the 2003 state title. "It left a bad taste in your mouth," Jones said. This year, "we were a year older and ready to take it." The good news for Central Dauphin is that most of the 2004 team will be back next year. Justin McCarthy, the leadoff runner for the 4x800 and 4x400 relay teams is entering his senior year. Andrew Rotz, who ran the third leg on both relays, will be a sophomore. Whiting, the nationally ranked discus thrower and shot putter whose discus toss of 193-feet-2-inches shattered the old state record by over eight feet, will return as a senior.